For beautiful and unique furniture with striking character, Bryonie Porter is the designer to turn to. 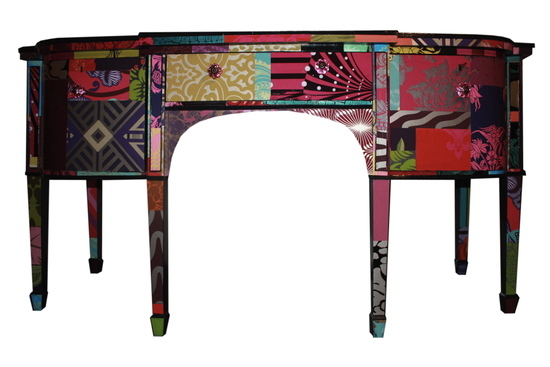 The unique creations from this UK based company are extremely sought after and since 2004, Bryonie has been re-designing furniture with fantastic results. From early Victorian chests of drawers to modern designs, she has created a collection of unique and inspired statement pieces. The individuality and quality of these products make them stand out and Bryonie has had a lot of media coverage over the years and undertaken many exclusive commissions. All pieces are hand finished and made in the UK. Any piece of furniture can be covered in any design, so if you would like something made just for you then please get in touch using 'Ask seller a question', and we will make your ideas a reality. Bryonie has recently started on a range of children's furniture which is fun and spectacular. Using wallpaper, comic books or even funky wrapping paper she creates great statement pieces for kid's rooms which are functional, durable and great looking. Delivery is by courier and the cost is £85.00.